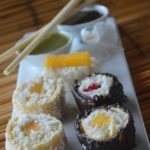 Today I am gonna present you a dessert which is a little different to my other recipes (little hint is the word “sushi” in the title). Because sometimes it’s time to try something new. Do you know the feeling when you see or eat something and immediately you have to think of something or someone? I was always the kind of girl who relates food to memories. I can exactely remember where and who I was with when I had the best ice cream (Lavender ice cream in South France with my brothers), what we were eating when I got my general qualification for university entrance (beautifully soft lamb) or what kind of beer we had when we celebrate our final exams in Budapest (Dreher and Borsodi). This list of memories is endless..! 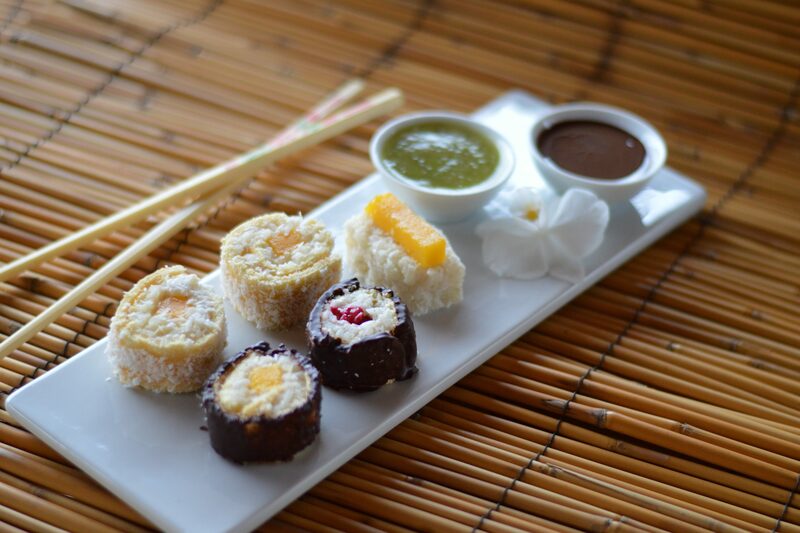 This time I was inspired by some special memories that come to my mind when I am thinking about Sushi. 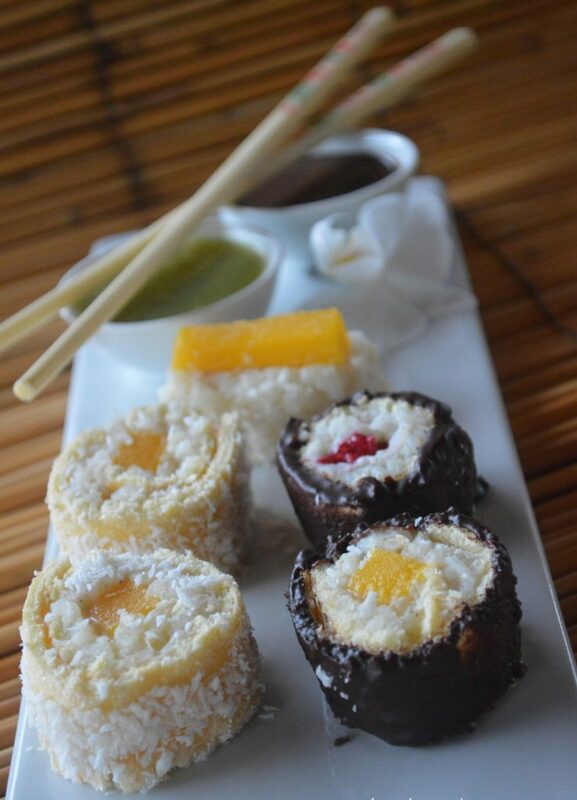 But as you already know I have a sweet tooth, therefore I thought about creating a sweet dessert Sushi! 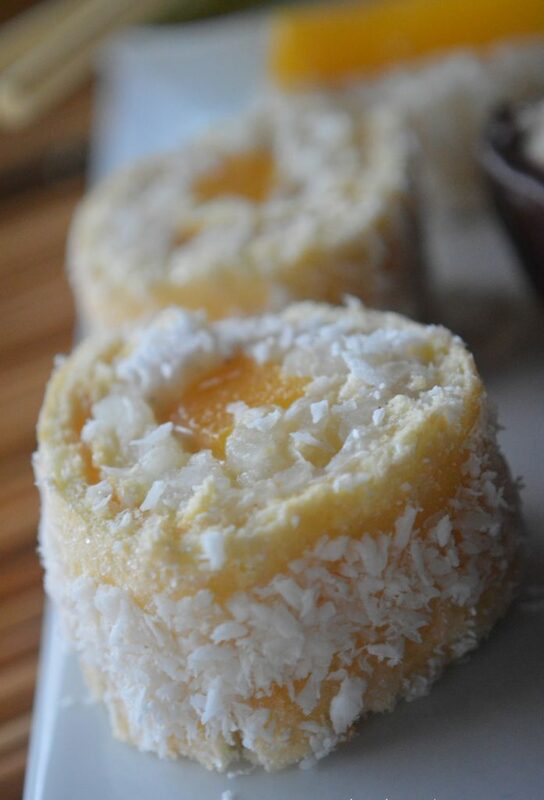 The combination of the fluffy biskuit, the coco milk pudding and fruit is very special and definitely worth a try! 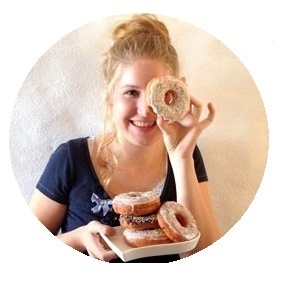 You need a little time to decorate but it’s fun and you eat with your eyes first! For the biskuit: Preheat oven to 200°C line up a baking sheet with baking paper. Mix eggs for at least 5 minutes until smooth and creamy. Slowly add sugar. In a bowl mix together flour, salt, baking powder and cake flour and add carefully to the egg-sugar mixture. Pour on baking sheet. Bake for 8 minutes. Prepare a clean dish towl by dusting with sugar. After baking remove from oven and drop on the dish towl. Slowly remove the baking paper and roll up the Biskuit in the dish towl. For the Rice: Cook rice acoording the instructions with both of the milks, sugar and salt. In the end mix with coco flakes. Cut fruit into smaller pieces. Take the Biskuit and carefully uncoil. Fill with the rice and add the fruit you like for filling. Very slowly and carefully roll up. 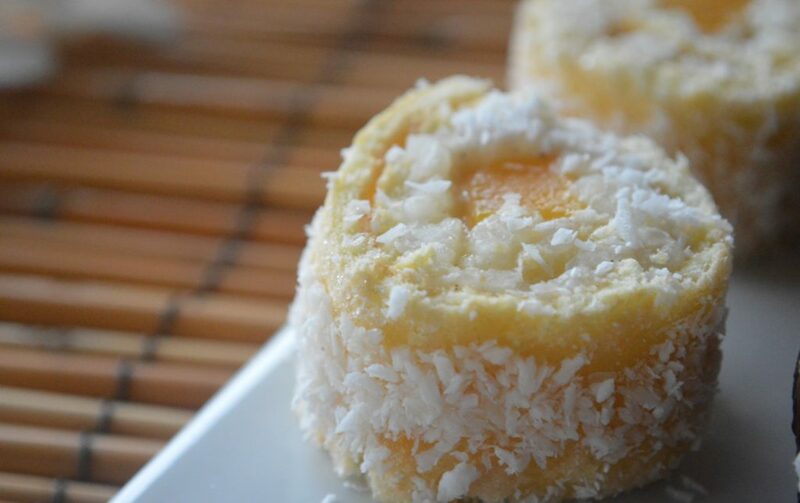 It's easier to cut the biskuit into 3 pieces and roll up the pieces individually. Decorate with chocolate, coco flakes, pistachio, brittle or fruit. (To make the decoration stick on the roll use chocolate or honey). When it comes to decoration, let your imagination run wild! For the "Wasabi": Mash kiwi until smooth (I even filtered it). For the "soy sauce": Melt the chocolate. Have fun baking and reminisce about your memories! They are stunning! I absolutely love your idea and these look quite delicious. 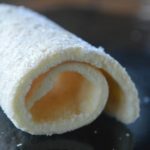 The rolled biscuit looks perfect! Love the dipping sauce as well 🙂 Admire your creativity Caprice! Wow what a compliment! Thank you!